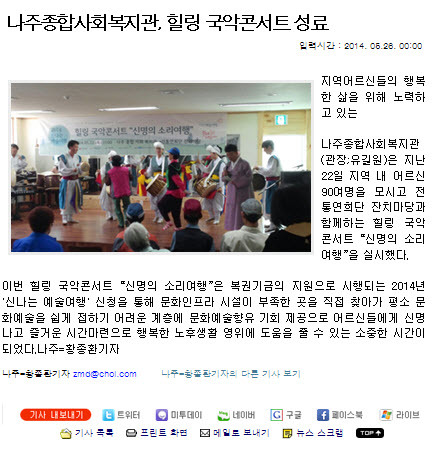 Naju Social Welfare Center (director: Yu, Gil-won) that is working for the local elders' happy lives, held 'Healing Gugak Concert-신명의 소리' with Janchimadnag on the 22nd and around 90 elders participated. 'Healing Gugak Concert-신명의 소리' is a part of 2014 신나는 예술여행 program, supported by the Korea Lottery Commission. This concert visits places where there isn't enough cultural infrastructure and provides opportunities for the underprivileged to enjoy culture and arts and have exciting and fun time. It was a valuable time for the elders' happy retired lives.